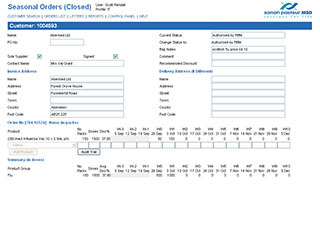 The seasonal orders application is an order entry system for vaccine products for seasonal diseases such as Influenza and Pneumonia. Orders must have the ability to be delivered during the coming season with fixed / staged delivery dates, and alternate delivery addresses. This is an extranet based web application and therefore accessible by the UK and Ireland field force (via the company VPN) and head office. The application has been re-built increasing stability throughout the system. The new design incorporates the company's primary blue colour, with clear areas for user input. The application is now divided into more appropriate sections (customer search, orders, letters, reports, admin, and help). Increased functionality has also be added to all sections.